These Women are Psychos! Season 6 Announcement Trailer: Orange is the New Black! The ladies of Litchfield are back with iron wills and nothing to lose. In maximum security, friendships will be tested and new allegiances will be formed. Will they turn on each other or keep their bonds intact? Orange is the New Black Season 6 launches globally on Friday, July 27. Basic Humanity Trailer: Orange is the New Black: Season 5! Orange Is The New Black: Season 5 – Photo by Jared Harrell/Courtesy of Netflix. Following directly on the events of the season four finale, the thirteen episode of season five of Orange is the New Black take place in more-or-less real time over three days as the inmates of Litchfield Penitentiary rebel against their inhumane treatment. Season 5 of OITNB premieres on Netflix on June 9th. Watch The Explosive First Minute of OITNB: Season 5! Season Five of Orange is the New Black begins at precisely the point where Season Four left off – with a riot in progress following the death of Poussey. Season Five will unfold in real time and over the course of just three days. Netflix has released a video of the first 60 seconds of the first episode – and eight first look photos (the remaining seven follow – double click to embiggen). Orange is the New Black returns on Friday, June 9th. Netflix and Chill? More Like Netflix and Cheat! When you’re in a relationship, there are certain things that become more important than others – even sacred; one of which is the promise not to cheat. If they don’t have the usual response when you’re watching Stranger Things/OITNB/(insert current show being binged together here) together, well, they might have been doing just that. Orange is the New Black Rejoins the General Population in June! Netflix has released an announcement video with the premiere date for the fifth season of Orange is the New Black. It’s simple, it’s striking and it’s just after the break. Pain and Suffering Trailer: Orange is the New Black: Season 4! Things are getting darker at Litchfield this season. One hundred new inmates have been unceremoniously dumped into the prison and the warden is more than a little worried. Even without the tweaks to the Emmy rules, I don’t think this season would have been eligible for Best Comedy Series. Check out the season 4 trailer following the jump. OITNB returns to Netflix on June 17th. Oscars® Snarked Trailer: Orange is the New Black! Even with everything that’s going on at Litchfield, the inmates still have time to throw a little shade at the Academy Awards®. Check out the first trailer for season four of OITNB after the break. OITNB returns on July 17th. Orange is the New Dark Matter? Syfy’s Dark Matter – from John Mallozzi and Paul Mullie (various Stargate titles) – will guest star Ruby Rose, who was featured in the latest season of Orange is the New Black, on its July 24th episode. Rose will play Wendy, an entertainment android who may be more than she seems. Follow the jump for more. Behind the Story with the Paley Center Digs Into Creative TV Series! SundanceTV has announced a new non-fiction series that will explore the creation and maintenance of some of today’s most creative TV series – like Recreation, Mad Men and Orange is the New Black. Behind The Story with the Paley Center will use footage from The Paley Center for Media’s PaleyFest 2013 and PaleyFest 2014 television festivals to take viewers through the personal stories of these shows’ casts and creators. Behind the Story with the Paley Center premieres on Tuesday, pril 7th (8/7C). For further details, follow the jump. OITNB Cast Gets Day Passes For CONAN! The cast of Orange Is The New Black will descend upon Conan O’Brien for Monday’s edition CONAN (TBS, Monday, 11/10C). O’Brien will welcome Taylor Schilling, Laverne Cox, Uzo Aduba, Kate Mulgrew, Natasha Lyonne and series co-star Jason Biggs for their first-ever joint appearance in late night. Follow the jump for more. Reminder Trailer: Orange is the New Black! 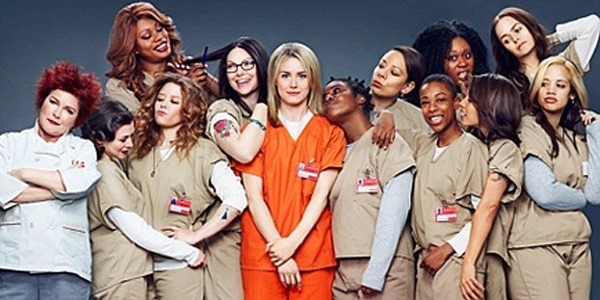 Orange is the New Black killed at the 2014 Critics Choice Television Awards with its second season. Netflix just wants to remind you that, if you haven’t been watching, it’s right there – both seasons, ready to binge on anytime you want. Check out their OITNB reminder trailer after the jump.